There are many chu char stalls in Bukit Mertajam and one such shop that serves simple and robust Teochew food is Yoong Kee Eating Shop. This shop is among one of the oldest Teochew restaurants around town. Located in Jalan Pasar (Market Street), the restaurant has been operating for over 60 years. In this chu char stall their signature dish is the Teochew style steamed fish. It is a must have dish for the customers of Yoong Kee. This dish comes with choices of stingray and white promphet. We opted for the stingray. The gravy was excellent; sourish as the three chunks of fish was steamed with salted plums, salted vegetable, chili padi, ginger and tomatoes. Simply MO TUCK TENG! 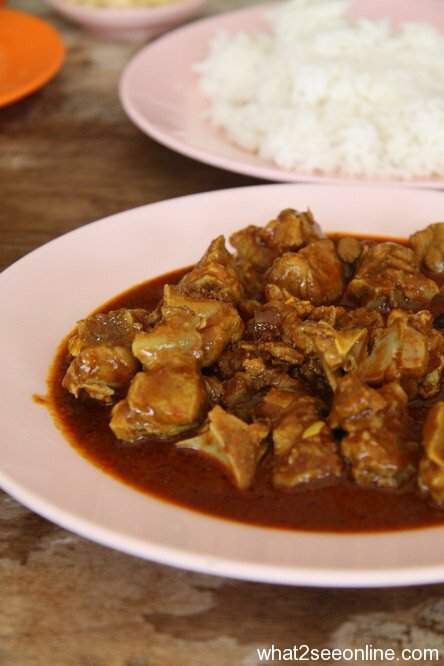 Curry spare rib – I feel that this dish lacks authenticity as it uses more of curry powder than spices. However, my son finds it a good compliment to the white rice. 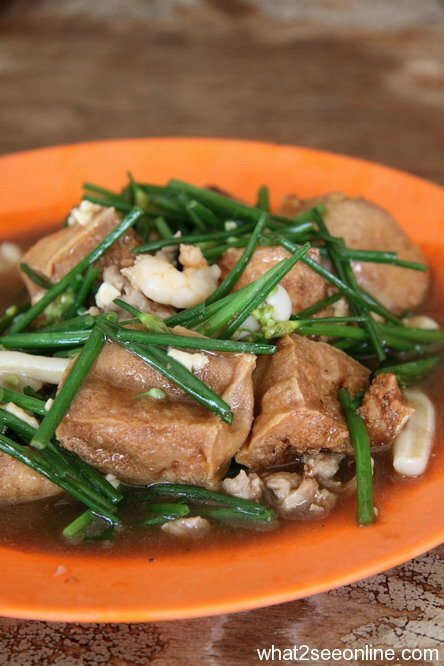 Stir fried chives with Teochew tofu in soy sauce is also one of their signature dish. The tofu is deep fried with the outer rim slightly crispy and soft inside. It comes with a generous amount of squid and prawns. Most customers like it for its simplicity and taste. Must have dish! The kitchen is just beside the sitting area. Yoong Kee maintains the old school look with the old fashioned concrete stove. Their cooks were seen walking around wearing the Chinese clogs, making the click-clack sound. The lunch is very reasonable priced. At RM36, it comes with free cold desserts of Kuai Leng Koe (black jelly). They serve plenty more other dishes, and some can be seen at Steven Goh’s blog. Click here for the Map Location. 24 Responses to "Teochew Food @ Yoong Kee Eating Shop, Bukit Mertajam"
ya, I do agree with you this restaurant really mou tuck teng. I love the cooking here as fish is fresh while the price is very reasonable too. I like the pungent aroma of Chinese chives-this dish with Toufu and seafood is lovely! although i live in BM, i haven’t tried this teow cheow food before!!!!! have you tried the white wanton mee @ “pek kong cheng”? Don’t have much knowledge on Teow Chew food except for Teow Chew porridge. Thanks for the information. Stingray looks good! Is hard to find Teo Chew Food (except porridge) that serves in Tai Chow way. Added to my hit list on to be visit when I am back in Penang. I love stingray in steamed clear style too! realise chinese style eateries tend to cook their curries in the wok, using lots of curry powder, hence the artificial taste. SimpleGirl – There are plenty more other dishes too. StevenGoh.com – Will sure to try out the other dishes that you had…looks good too. Selba – There are not many these type of teochew chu char outlets left. foodbin – This kau choy fah is also my favorite vegetable. Duckie – In that case, do introduce more BM food to us. Jack Tai – Thanks ! Food Paradise – We find the prices very reasonable too. Sugar Bean – You are most welcome. email2me – This old type of chu char stall will be what you are looking for…tasty too. cariso – Take a weekend drive over there to try out this chu char. J2kfm – Have to agree with that. the stingray looks interesting. i have never seen it steamed with just hamchoy and tomato before. if u have chance to find it, perhaps u can try steamed stingray with chili padi only. it is very good too! you should hv taken pic of the big original sign board with the tel no. in 3 digits.. very old shop indeed. their steamed promphet is very good. the fried kai lan with salted flat fish is fantastic ! and also not to be missed is their groundnut soup with ribs. U may try another chu char stall just next to Yoong Kee also not bad. I like the fried eggplant and u may order Rojak from opposite stall. Everyone – Nice of all of you for recommending so many new dishes and also the laksa & popiah to me. Thank you! The sting ray is nice isn’t it? Recently I have visited a another chu char place, Sum Sook Restaurant which serves sting ray too.